There is an economic boom in Africa that has been made possible by the good policies and efficient implementation by African governments in cooperation with private partners and regional bodies like the African Union. This has been driven by the global adoption of regulation strategies that enable innovation and cooperation as opposed to be deterrents. Trade restrictions and distortions in world agricultural markets has been corrected and prevention measures are in place, including through the parallel elimination of all forms of agricultural export subsidies and all export measures with equivalent effect. Measures adopted and implemented to ensure the proper functioning of food commodity markets and their derivatives and facilitate timely access to market information, including on food reserves, to help limit extreme food price volatility. This has been enabled by technological advancements across the globe whereby intra and inter country trade is traceable and quantifiable. Every person on the globe has access to vital trade information on their mobile devices. Universal access to affordable, reliable and modern energy services has been achieved. The share of renewable energy in the global energy mix increased substantially. This has been driven by the global emphasis on clean energy as signed at the Paris Agreement of 2015. The availability of nutritious and drought resistant food crops has ensured that Africa reaps the demographic dividend as more people reach their daily energy dietary requirements. This has not occurred in isolation as there is a general global trend whereby nutritious food is abundant as shown in the Sunshine robot. African agricultural productivity and product quality has increased, and the continent is engaging other trade partners as equals. The continent has become self-sufficient and buoyed by the increased exports, job created have exponentially grown and keeping abreast with the population growth. This is driven by increased cooperation, access to affordable technology and the global abundance of water and power. The land redistribution policies adopted by African countries have led to efficient and equitable land use across the continent. Global spatial planning has improved, and this has helped African governments resolve disputes and take informed decisions. Tangible assets like land and water bodies are now managed professionally and ownership questions have been resolved. This has driven the sharp rise in African youths taking part in agriculture. 90% of previously unemployed youths are now actively contributing to the economy of the continent. Improved mobility within and between countries and continents has led to cultural vibrancy and diversity of ideas and innovations. Fair treatment of agriculture workers in Africa has led to increased output and innovation that has drastically increased on-farm and off-farm productivity leading to an increased average household income for rural families. The international drive towards respect of human rights has driven has been adopted by countries across the globe, this has immensely benefited African agricultural employees. Investment into agriculture and green technology increases exponentially, this can be attributed to African agriculture being structured such that 90% of the ventures are bankable. Local and international venture capitalists are clamoring to have a piece of the pie as the ROI is high. The availability of cash injected into projects and new ventures has had a domino effect on job creation which is at an all-time high. Technological advancements have improved the decision-making process of VCs and DFIs as they have efficient ways of monitoring and evaluating projects anywhere in the world. Cultural vibrancy and increased mobility have also been at the center of improved funding as entities from different parts of the world get to appreciate foreign cultures and norms. African economies are now so robust that they are resilient to financial speculation. Years before the staple crops in Africa were now being used for other purposes besides food production which caused a shortage and compromise the continent’s food security and stability in general. This created conditions for speculation but thanks to the proactive African governments whose foresight led to improved food management systems that have increased efficiency. The abundance of nutritious food, water and power has seen the diversification of food sources. Technological advancements have led to more efficient distribution of food, the old situation in 2018 whereby food for everyone in the world was available but asymmetrically distributes has been corrected. Data and information driven integrated water, land, food integrated management systems have seen data scientists, engineers, business analysts and many other professions being included in the natural resource economy like never. This has created may jobs. This has been enabled by the global diffusion of innovation and technology. Through collaborative efforts by African governments, the AU Science Commission for Africa is able to fund a continent-wide 10-year project that eventually yields a vaccine for Malaria, the hitherto leading cause of death for many Africans. The discovery leads to a more productive workforce and less pressure on national health systems. As a result, more funds are spared for continued research in other emerging diseases. The retreat from the global stage of America and the EU – on account of an aging population and weakened EU – sees the AU assume a significant role in the world. Through its sustainable cities initiative, AU countries commit to invest in “green” cities that are fuelled by the innovation economy driven by young Africans who constitute over 60% of the continent’s population. In the wake of disintegration of the EU and NATO, new thinking adopted by African political systems has led to the improvement of advanced and integrated water, food, land and environmental management systems and this has resulted in the creation of more than 500 million new jobs across the continent in the green economy. Countries are showing political will and foresight in maintaining high levels of environmental protection and productivity. African governments have adopted and implemented successful conflict mitigation and resolution policies that have seen natural resource-based conflicts eradicated. These policies were inspired by the conflict between Ethiopia and Egypt that was averted in 2018 through dialogue. Africans now have comprehensive cooperation and trust building mechanisms with regards to trans-boundary water resources. African countries are now more resilient to external shocks due to geopolitics or external financial crises. This resilience is a direct result of regional cooperation and liberalized trade among African nations. Boarders have been removed and free movement of people is now possible across the continent. Food security and abundance of sustainable natural resources can be attributed to deliberate decisions by African governments to balance between bio-fuel crops like jatropha and food farming. In 2018 there had been an increased risk of environmental degradation as farmers were mostly using fertile land for quick cash-generating bio-fuel crops that were damaging the environment, but African countries collectively resolved to solve the issue and have adopted integrated environmental management systems. Laws and regulations around green taxes and fossil fuels encouraging environmental protection are now the norm. High penalties are being issued to corporations that do not adhere to these. Production of biofuel crops now being undertaken in a way that promotes rural growth and provides smallholder farmers and rural workers with employment opportunities while minimizing potential environmental impacts. Reduced water pollution and desalination have seen the increase in fresh water supply. African people’s behavior coupled with technological advancements and political will have contributed to the success in water management. Driven by the need to offer African people decent amenities, governments have achieved their objective of offering ablution services for all by 2030. No African child should not have a decent toilet. International cooperation and capacity-building support to developing countries in water- and sanitation-related activities and programmes, including water harvesting, desalination, water efficiency, wastewater treatment, recycling and reuse technologies achieved. All these activities require labour. The culture of business has changed, global MNCs working fairly with local corporations to solve wicked societal problems. It is now a thing of the past when European and Chinese dictated to African partners how business should be conducted, to succeed in Africa companies now have to cooperate and have the local people’s interests at heart because there is a renewed self-assuredness among African countries. Physical boarders are no longer a deterrent to movement and trans-boundary cultural alliances in the form of marriage and other forms of cooperation are now the norm. This has led to free movement and acceptance of foreign labour within the African continent. To make skills exchange more efficient, African governments have adopted a harmonized skills alignment authority that ensures that all qualifications are benchmarked and transferable anywhere in Africa. This has led to competency-based hubs that attract Africa’s most talented people without restrictions based on country of origin.African people have become accustomed to genetically modified foods. Genetically modified foods now augment traditional food production. The culture of aid has changed, sustainable aid has empowered beneficiaries to be self-sufficient. This has created many jobs. Due to technological advancements, Africa is now able to fight disease and more able-bodied young men and women are contributing to the continent’s well-being. A direct result of the technological improvements is that Africa can now satisfy the global increased demand for meat and dairy products. This has led to a sharp decrease in rural to urban migration because Africans can now make a decent living wherever they are on the continent. 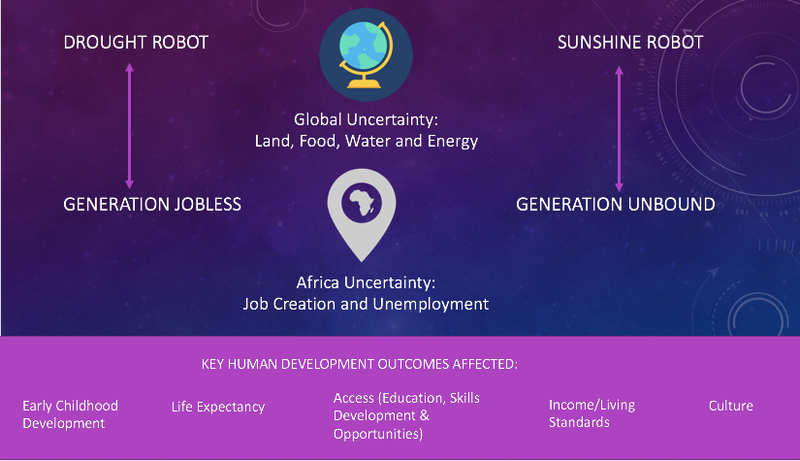 African countries now have the technology and skills to harness their natural and human resources’ productive power. Governments in conjunction with local and global private companies has been able to train millions of Africans sufficient computer skills that has seen a surge in innovation and connectivity. These basic skills have led to many youths starting their own business ventures and with the help of government, the rate of business failure has declined. Solar and wind technology have improved drastically and now in use across the continent. Finally, African countries can harvest the abundant sun and wind for energy production. This has reduced power cuts across the continent and has given rise to new industries which are now employing millions of youths. Africa now relies less on rain-fed crops and inefficient irrigation systems, this has been enabled by the adoption of homegrown technological mechanization innovations. With every innovation, there is an associated economy that employs a lot of African youths. Less rural to urban and Euro-bound migration because of diffusion of innovation and investments. Its no longer a Silico valley preserve but technological innovation permeate every corner of the African continent. This has reduced the need to migrate to have access to innovations. The internet has penetrated the whole continent and its power to democratize the access to information is evident in Africa.